Rich & creamy this fudgey Bailey’s Irish Cream Chocolate Sauce is quick, easy, and will knock your socks off with flavor. Perfect over ice cream, donuts, or even stirred into your morning cup of coffee- this sauce is a must-have on hand for a sweet simple moment of indulgence. OMG. Y’all, St. Paddy’s Day is coming, and I’m totally under-prepared this year. Thankfully, (in theory) I’ve got 14 days to get it together and get prepared. Good thing too, because while I don’t spend tends of money, my kids know to look forward to at least a couple tasty themed treats for small holidays (for us) such as this. While I’m not starting this year off with specific ‘St. Paddy’s Day’ themed fare, like other years, I’m gonna go with a looser ‘Irish’ theme. I feel like whenever I think of ‘Irish’ food, I end up thinking of traditional dishes like Colcannon, the ever flavorful dual combo of corned beef & cabbage, Irish soda bread, or pretty much anything with Guinness in it (yes, I know that last one’s a wee bit stereotypical). While we hold those recipes near and dear to our foodie hearts, I always try to spice things up with something that is not the traditional norm. For example, we’ve done Irish Pub Nachos and even Irish Potato Candy. 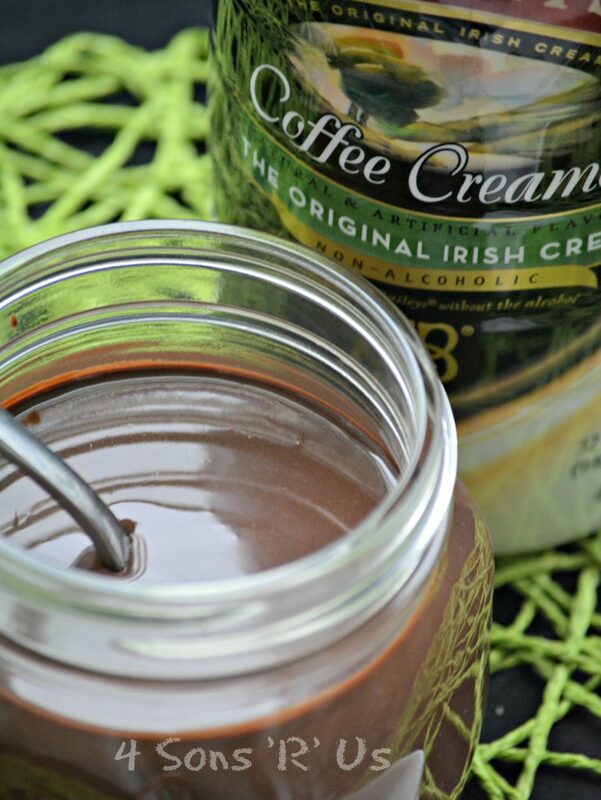 This yummy Bailey’s Irish Cream Chocolate Sauce follows perfectly in that same vein. A little bit different, still with an Irish theme, and totally delicious. Thick and creamy with a pleasant Irish cream flavor infusion, this fudgey chocolate sauce is equal parts rich & indulgent while surprisingly easy to whip up (with only 4 ingredients). 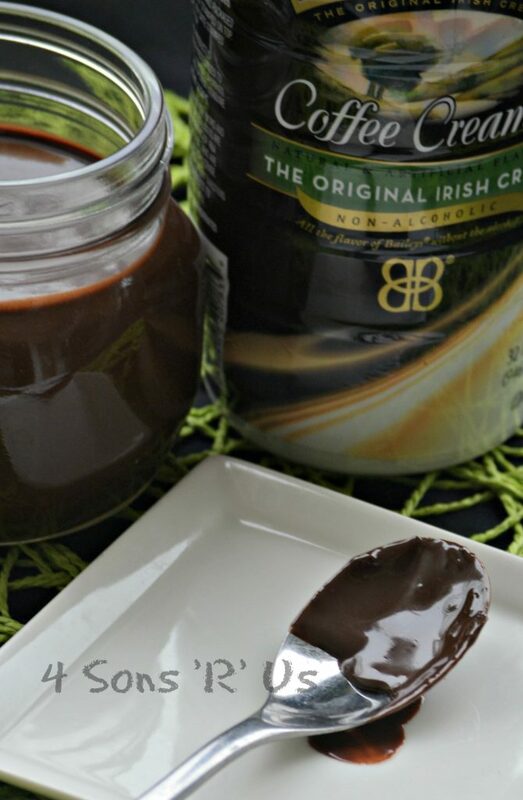 Bailey’s Irish Cream Chocolate Sauce is perfect served over a bowl of ice cream. Freshly baked donuts can be dipped in it for a perfect ganache style icing. It’s also a beloved addition when stirred into my morning coffee. However you choose to enjoy it, you’re sure to love it! This quick & easy fudgy chocolate sauce is mixed with Bailey's Irish cream for an indulgent treat. In a medium sized mixing bowl, whisk together the creamer, powder, and syrup until smooth and completely incorporated. Pour this mixture into a sauce pan, or skillet, bring to a boil (stirring constantly) and then reduce to a simmer. Simmer for 3-5 minutes, or just until thickened. Remove the pan from heat, and stir in the chocolate, continuing to stir until smooth and completely incorporated. Let the mixture cool 2-3 minutes before using. Use immediately, or store in a sealed container in the fridge until ready to use. If storing, heat the mixture up before serving so that it becomes pourable/spoonable. 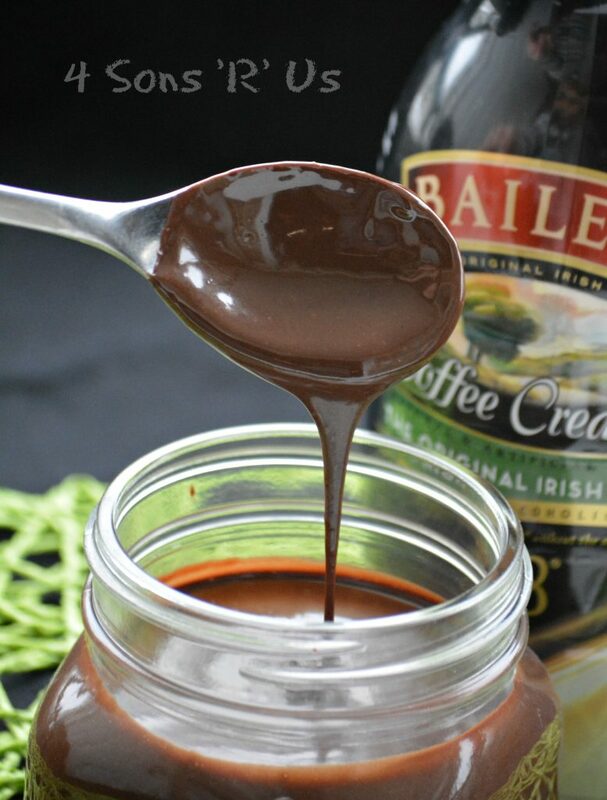 I’m so in love with this Bailey’s Irish Cream Chocolate Sauce! I bet it would be PERFECT over ice cream, like SUPER perfect! Ahhh I can’t wait to give it a try! Hello!! 🙂 I am one of the co-hosts this week for Fiesta Friday, so I am heading around to everyone’s blogs to check out their exciting Fridays! I like the idea of a simple recipe for St Pattys Day! Who doesn’t love a good chocolate sauce! You can never go wrong with chocolate for any occasion, Abbey! !